We all need to take some time out – don’t we just? For various reasons, many of us are in search of solace. As a recent convert to running, cardio-vascular exercise helps zone things out and, in a directly complementary way, so does the controlled breathing and stretching of yoga which I’ve done for considerably longer. However, you can take it a stage further with restorative yoga. This type of yoga is a series of supported floor poses that allow the body to work passively with gravity to relax into position. Poses can be held for five or ten minutes during a 90 minute or two-hour session and classes are small (or one-to-one) so the teacher can ensure you are correctly positioned. It also works like meditation, calming the mind and can improve the immune system and help balance the nervous system. You can read more detailed information here. However, restorative yoga requires a number of props (blocks, straps, eye pillows, bolsters and blankets), so you don’t see many classes offering it, but it is something rather special. Fortunately, here in Barnet local yoga teacher and massage therapist Anthea Sweet of Bodysense offers small group classes or private individual sessions. Other local options include Yogavani in Potters Bar who offer Mindful Yin Yoga and Restorative Yin and Yang classes. Yoga Balance in North Finchley have occasional workshops, so it’s worth keeping an eye on their website to see what’s coming up. 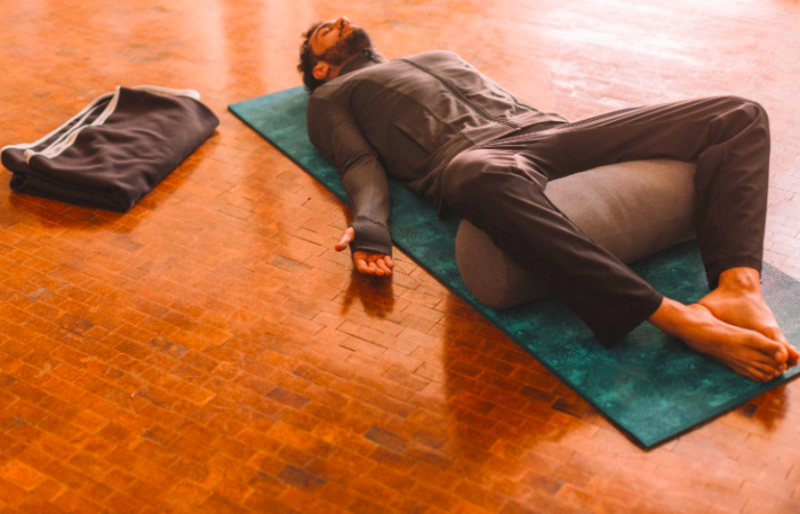 Restorative yoga is apparently the deepest form of yoga. That makes it sound very serious, but on a personal level, at the end of a stressful day, it is pure bliss. Images courtesy of Amazing Yoga Vienna (main picture) and Decathlon (above).